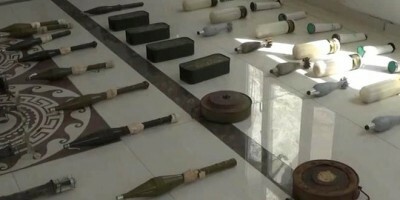 The popular defense groups confiscated amounts of ammunition, different sorts of shells and weapons in the northern countryside of Sweida province, foiling terrorists’ attempt to transfer them through al-Lajat area to terrorists positioned in Eastern al-Badiya (desert). A source at Hasaka Governorate told SANA Thursday that the terrorists transferring the munitions were ambushed by the popular defense groups Wednesday evening in Kou’ Hadar area. The terrorists suffered losses, with many of them getting killed, while others fled away leaving behind mortar shells, land mines, RPG shells, ammunition of machineguns and Israeli-made LAU missile, according to the source. On Wednesday, authorities confiscated in cooperation with the popular defense groups a car loaded with rocket, mortar and artillery shells, mines and half a ton of TNT in the southern countryside of Sweida that was heading eastward.